The purpose of the College of Agriculture, Forestry, and Natural Resource Management (CAFNRM) is to provide quality education to assist individuals in acquiring the scientific knowledge, attitudes, and practical skills needed to practice environmentally sound, sustainable agriculture and to be productive and responsible global citizens. The program blends comprehensive classroom instruction with practical, technology-based education through use of the University of Hawaiʻi at Hilo Agricultural Farm Laboratory and on-campus laboratory facilities. CAFNRM graduates skilled agriculturalists who can further develop and promote agriculture in the State of Hawaiʻi, the United States, the Pacific Basin, and other countries. The College is especially interested in moving agriculture in the tropical and semitropical areas of the Pacific Basin toward more economical and self-sustaining methods. Aloha, Kokua, ʻOhana, and Laulima: the commitment to work with others to improve agriculture and to benefit the community. Goal 1. Use multiple sources, including current and older literature, to find, evaluate, organize and manage information related to diverse agricultural systems. Goal 2. Demonstrate competence with both laboratory and field-based techniques used in modern agricultural systems. Goal 3. Understand how global issues including climate change, energy use, chemical use, water availability and food safety impact sustainability of agricultural systems. Goal 2. Anticipate and recognize problems and make recommendations for addressing the problems using appropriate techniques and skills. Goal 3. Develop, identify and employ best management practices that lead to sustainable solutions and outcomes. Goal 4. Apply principles of business, marketing and management to an agricultural enterprise in developing the various components of a business plan. Goal 1: Communicate effectively with various audiences using oral, written, and visual presentation skills, and contemporary networking/social media technologies. Goal 2: Describe and assess the influence of plant and (or) animal production systems and its management on environmental sustainability and restoration. Goal 2. Plan, engage, and learn from actions that demonstrate civic responsibility to community and society. 1 The terms “agriculture” and “agricultural” as used herein include aquaculture. Note: More specific goals for the different specialties will be listed in the class syllabi. A unique feature of the College is the University of Hawaiʻi at Hilo Agricultural Farm Laboratory. On 110 acres of land, students can experience practical learning in various enterprises such as: anthuriums, ornamental foliage, hydroponics, floriculture plants, orchids, forestry, vegetables, sustainable agriculture (including integrated nutrient and pest management principles), livestock production, beekeeping, tropical fruit, and aquaculture. Because direct application of newly gained knowledge is an integral part of the College’s educational goals, many laboratories and courses are based on the farm. On campus, the CAFNRM building provides laboratories for many of the courses in horticulture, plant tissue culture, animal science, entomology, plant pathology, plant physiology, and agribusiness. Students can also utilize the laboratories and campus greenhouses for special projects in directed research courses. Additional laboratory facilities for agronomy, aquaculture, natural resources, and soil science are located beachfront at the Pacific Aquaculture and Coastal Resources Center. 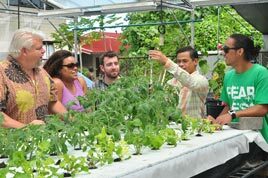 Hilo’s location in the center of a large farming community provides opportunities for field trips to many diversified agricultural and aquaculture enterprises. The farm also houses the developing pastures, equine arena, and covered pavilion for courses, flower shows, and community related events. Note: Shoes or boots are required in certain laboratory classes. In addition, suitable eye protection may be required in certain laboratory classes. This organization is open to every student who joins CAFNRM. Students are expected to help in maintaining a collegial atmosphere that is nurturing and enables the growth of the CAFNRM ʻohana. Through Organization activities, students make life-long friendships, learn business and management skills, participate in group activities, foster collegiality and civility, and bring respect for the agricultural, forestry and natural science disciplines and the issues that surround them. Agriculture (AG): Provides a broad preparation in the basic and applied sciences of modern agriculture. Agribusiness (AGBU): Provides a strong background in the business aspect of agriculture, including management, sales and distribution. Agricultural Economics (AGEC): Provides an understanding of economic theory and economic policy and efficient management with limited economic resources in the production of food and fiber. Agricultural Engineering (AGEN): Provides basic mechanical skills and engineering principles required for the student to be successful in modern agricultural enterprises. Agronomy (AGRN): Provides the theory and practice of field-crop (food, fiber and feed) production and soil management. Animal Science (ANSC): Provides a wide variety of courses that integrate genetics, health, housing, management, nutrition, physiology, reproduction and evaluation of livestock. Aquaculture (AQUA): Provides a broad understanding of the scientific basis, design and management of aquaculture systems and fisheries. Entomology (ENTO): Provides basic knowledge on insects and their habitats as well as how to control insect pests. Horticulture (HORT): Provides an extensive base of horticultural practices such as grafting and pruning, the cultivation of fresh produce (fruits and vegetables), herbal, and ornamental crops that are of economic interest in the tropics and subtropics, as well as advanced techniques such as hydroponics, plant tissue culture, and hormonal manipulation of plants. Natural Resources (NRES): Provides a multi-disciplinary systems approach to understanding and managing the environmental resources of island ecosystems, and their relevance to coastal zones in general. Plant Pathology (PPTH): Provides the understanding and management of plant disease, the mechanisms by which pathogens produce disease, and the interactions between pathogens and host. Plant Physiology (PPHY): Provides the understanding of plant growth and development. Soil Science (SOIL): Provides the background for the properties of soil and soil management, with an emphasis on the role soils play in environmental studies as well as agriculture. In order to earn a Bachelor of Science degree in Agriculture, students must not only fulfill the requirements for the major but also meet all of the University’s other baccalaureate degree requirements. (Please see the Baccalaureate Degree Requirements.) Students wishing to make timely progress toward graduation are urged to pay careful attention to all degree requirements. In addition, when planning a schedule of courses, it is imperative to be aware of course prerequisites and the frequency with which courses are offered. See CAFNRM Courses below for course information. To assist students in planning their schedules, CAFRNM posts curriculum sheets on its website. In addition to using these guides, students are strongly encouraged to meet with their advisor each semester before registering. Last updated on Tuesday, April 2, 2019, 2:30pm HST.